The Terry Ryan Treat Pouch features a super-strong hinge that stays open for easy access, and closes at a touch to keep interested noses out! The pouch's storage pocket is large enough to fit your entire hand. The treat pouch belt is adjustable and detachable, providing the option of simply clipping the pouch to your belt or pocket. A key ring keeps your clicker or keys handy. 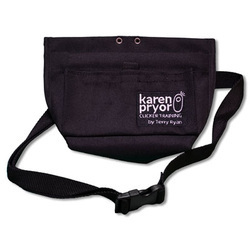 The Terry Ryan Treat pouch has a water-resistant lining for easy cleaning and is machine washable. The front velcro pocket is very secure and just the right size for your cellphone or other bits and pieces. Pouch measures approximately 6.5 inches x 8.5 inches. Opening measures 3 inches x 6 inches. Note from Bex: I find this pouch holds sufficient for an intensive 10 minute training session (at least), setting me up to ensure the horse has a break while I refill. I've been clicker training for 15 years or so and this is my favourite pouch by far! It's lasting really well also, and I'm pretty rough on it.